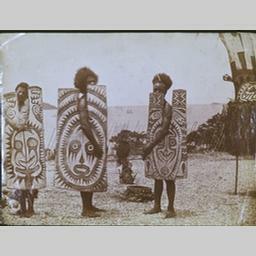 Pictured above : Portrait of men in ceremonial dress, Port Moresby, Papua New Guinea, ca.1890 - (collection) Council for World Mission/London Missionary Society - (owner) Council for World Mission. From the Internet Mission Photography Archive [see earlier post about the archive]. 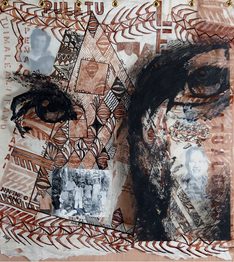 A Pacific Islander exhibition, TURNING TIDES: Gender in Oceania Art, opened in San Diego in conjunction with a session held at the annual Association of Social Anthropologists in Oceania (ASAO) meetings. The exhibition ran at the University of California San Diego Graduate Gallery and Performance Space, Feb. 7-16, 2006. < Reggie Meredith. Self Portrait. n.d. Mixed media. This exhibition was curated by Samoan artist and studio art professor Jewel Castro, with Dr. Pamela Rosi and Samoan artist Dan Taulapapa McMullin. As Jewel Castro has noted, "TURNING TIDES is the first exhibition of its kind on the United States mainland. It is curated by Pacific Islanders (we have adopted Pamela) for Pacific Islanders. It will highlight artists who are expressing a contemporary identity that links indigenous Pacific gender roles, with the history of traditional art forms, the influence of personal location and experience, in a desire for authentic representation. Artists based in Papua New Guinea, Samoa, New Zealand, Hawaii, the United States, and England, will be featured. Movement of the exhibition to other venues after UCSD is being planned." The art exhibition featured paintings, photographs, sculpture, tapa and video by artists: Dr. Richard S. Cooper, Tupito Gadalla, Keala Kelly, Shigeyuki Kihara, Fonofale McCarthy, Dan Taulapapa McMullin, Regina Antoinette Meredith, Julie Mota, Rosanna Raymond, Larry Santana, Filipe Tohi, Daniel Waswas, Jane Wena; Jewel Castro; and the Otufelenite Tongan Community group's Ngatu project organized by Dr. Ping-Ann Ado.